My daughter at the previous festival in 2014. 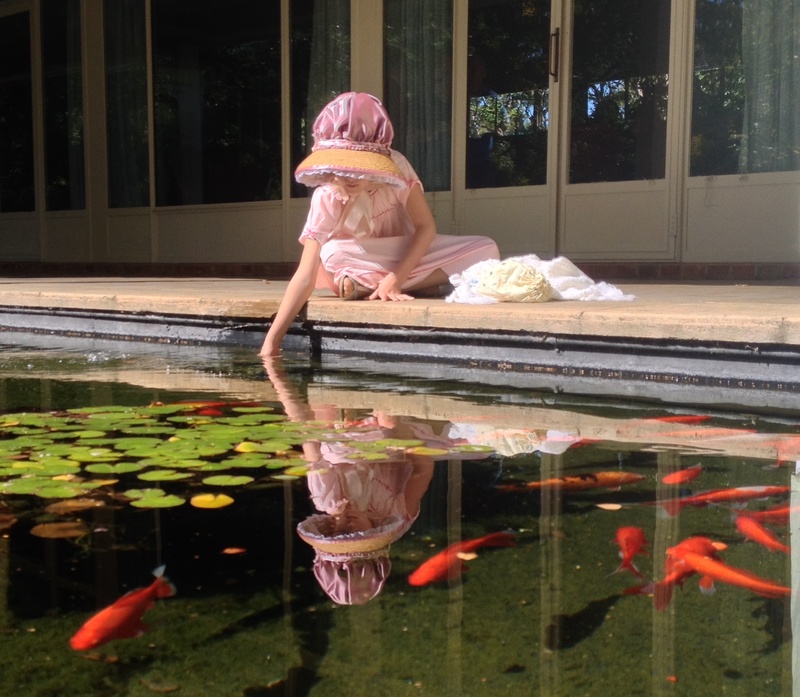 A few months ago I went to the Jane Austen Festival in Canberra with my daughter, and I was eager to make her a new dress to wear. So, in addition to letting down a number of her other gowns, I set myself the task of drafting a pattern for her. I have wanted to learn the art of draping for awhile too, where material is held onto the body (or dressmakers form) and cut, smoothed and pinned to fit. Generally speaking, the process most of us use is to pin our pattern piece to the material, which is cut and sewn and then finally fitted. 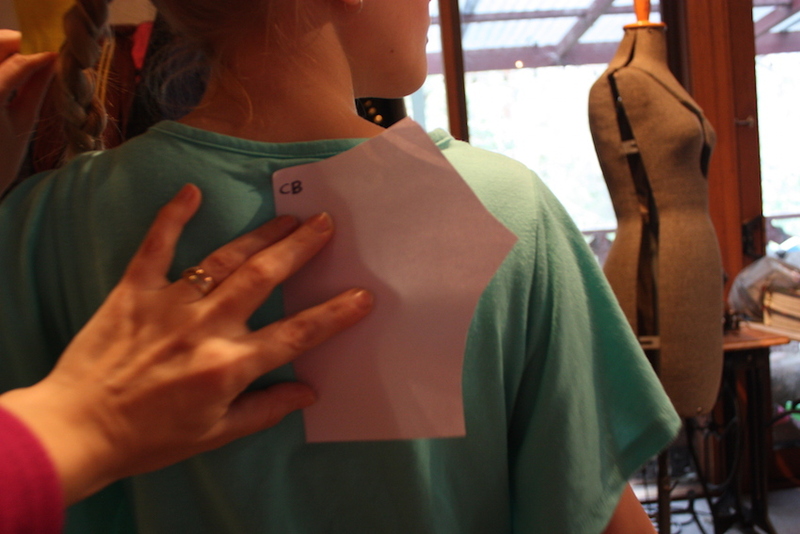 However, many experienced dressmakers tell me that draping is a really good way to get an effective fit for a garment. For this gown I did not have heaps of time to learn (and have the necessary trial and error achievements) for draping, so I thought I could try and drape using paper. Effectively I would be laying paper on the body and cutting around it to form the pattern pieces to use. button fastenings at the centre back. 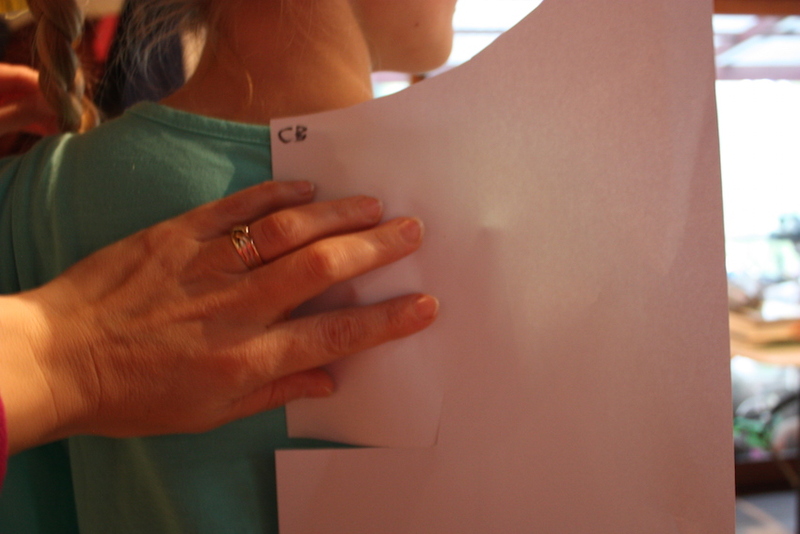 Step Two: I held up a piece of paper against my daughter, starting with the back. I made a back bodice piece first, then the front bodice piece, and then a side bodice piece. I cut the paper roughly to size (its always important not to accidentally cut hair or clothes!!) and then neatened it up later. The back bodice piece being cut out on the body. As I cut the pattern pieces, I made them as I wanted them to look when finished, that is, I made them without seam allowances. This meant that the pieces needed to meet each other along the seamlines, and the centre front on-the-fold-line should be on the centre front line of the body. Likewise, the centre back area needed a bit extra for the overlap to place buttons and buttonholes (which I added to the pattern notations later). The back bodice piece finished. 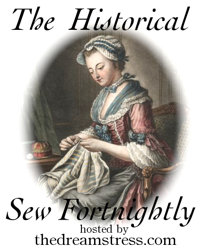 The shoulder seam is set far back, as was the fashion during Regency. I think it is actually more difficult to draft/drape with paper, as it is much hard to pin and hold in place. However, it felt a lot less scary than cutting into fabric while holding it on the body. I did throw out a few sheets of paper, as I inevitably made mistakes with my cutting lines! Step Three: I wrote notations on my pattern pieces to stop me getting confused later. Things such as: notches to show which panel is joined to which; the centre front and back; grainlines; place-on-fold marks. You can see below that I made a reminder for myself to allow more at the centre back for the button placket that I intended to make. These are the pattern pieces with the notations added. Once fitting adjustments were made, the pattern pieces can be altered (which they were). It is also a good idea to name the pieces, which I haven’t done here. When marking grainlines, it is a general rule that the grainline runs parallel to the centre front/back line (and perpendicular to the waistline). 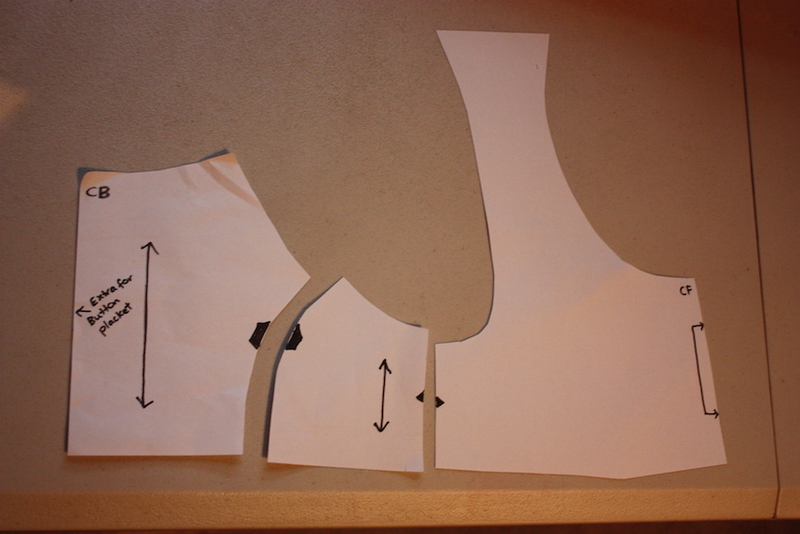 Step Four: I began to cut out the bodice pieces. Just in case I had made a mistake, I allowed bigger seam allowances on all the side seams of the bodice and the centre back seams. This allowed me to have “room to move” to make some fitting adjustments later. Step Five: The skirt pieces I cut out with reference to a pattern of an extant girl’s dress I have made before. My skirts were in three pieces (1 centre front piece cut on the fold, 2 back pieces cut on the selvedge) and were slightly flared (which I like because the child can run around a little easier). 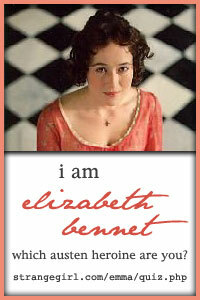 I merely had to measure how long I needed them to be, that is, from the Regency waistline to the floor. The gathers of the skirt were all pulled to the centre back. Step Six: The sleeve pieces were a bit more tricky. For the oversleeve, I flat-patterned the sleeve based on some other sleeves I had made, and then I just adjusted it to fit on the dress. You can use the extant pattern link above as a starting point, or use a tutorial for patterning puffed sleeves. I made it quite puffy, mainly because it is easier to make it smaller but impossible to make it larger if you have cut it too small! 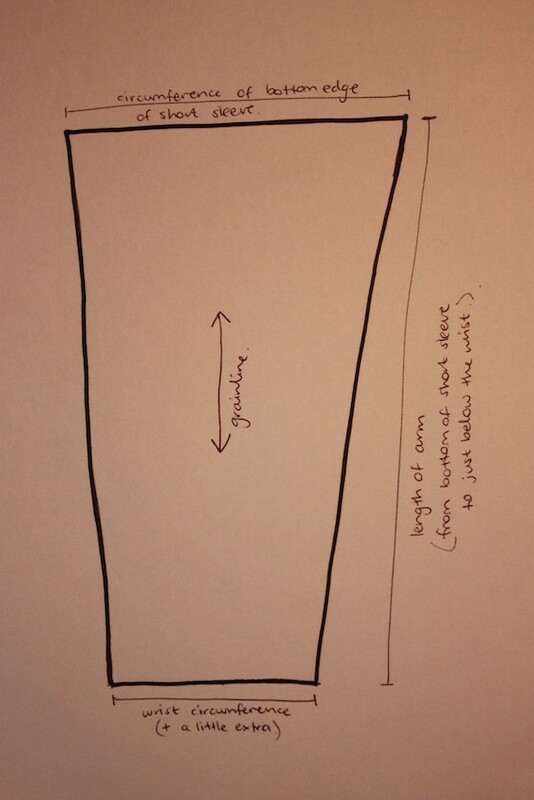 The undersleeve was a very basic symmetrical shape, which I have sketched below. The undersleeve is a symmetrical piece (even though it doesn’t appear so from my hurried sketch). Step Seven: For the neckline, I sewed bias binding to the raw neckline edge (right sides together) and then folded it to the inside, leaving none of the binding visible. It was machine sewn down to make a casing. I threaded a piece of cotton tape through the casing and then pulled in the neckline to fit. Rather than having to tie it up at the back, I sewed the tape to the casing at the centre back to secure it. Step Eight: The last parts to do were the hem, the dorset buttons and buttonholes. The dorset buttons and buttonholes completed. 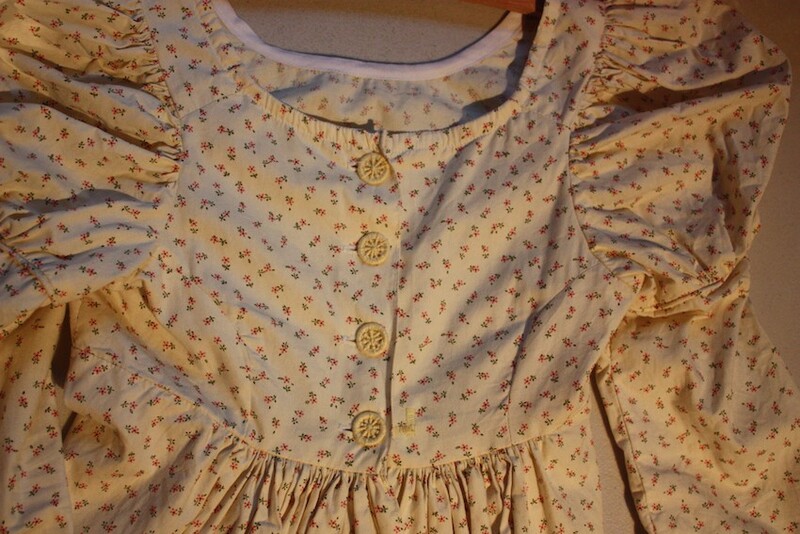 You can see the centre back gathers on the skirt, as well as the piping around the bottom edge of the puffed sleeve. The bias binding is also visible around the inside of the front neckline. Here are some pictures of the finished dress worn during the Festival promenade on the Sunday morning. The back view (with some dorset buttons popped off, which were replaced later). I found this process to be a good way to practise draping and drafting. I hope it encourages you to try it too!